Just Jingle: Simon Says MERRY CHRISTMAS! YAY!!! It's Christamstime over at Simon Says Stamp Challenge Blog this week! We have all used some super fun Simon Says Exclusives to create Christmas cards to share with you! I ended up creating this card in bulk, actually, because I just loved this design! I did nearly twenty of them. I am also linking this up to the CASology Challenge this week - Star! I die cut the Absolutely from shiny silver paper and mounted it with foam tape. I stamped and embossed the silver stars and stamped the sentiment directly onto the silver paper. The silver string was the perfect finishing touch! 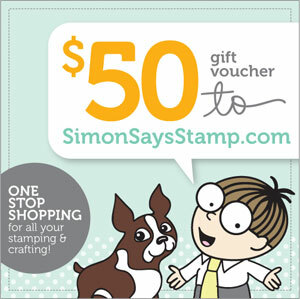 And, of course, one lucky challenge participant will win a $50 Gift Voucher to Simon Says Stamp! So now it's your turn to play along! Happy Crafting and MERRY CHRISTMAS! You have until Wed 26th Dec 8am Ohio time. 1pm UK time, 2 pm CET to join in. Your creation must be new. No backlinking. Thanks! You can find the goodies I used on this card in the links below! love the cas look to this- so elegant! Beautifully done, Jennifer! Merry Christmas! I am new to the Bigshot and am just getting into using it. I am inspired! And the new "I must have it" is the AE stamp set!! Every card I see with sentiments from that set make me scream with delight. 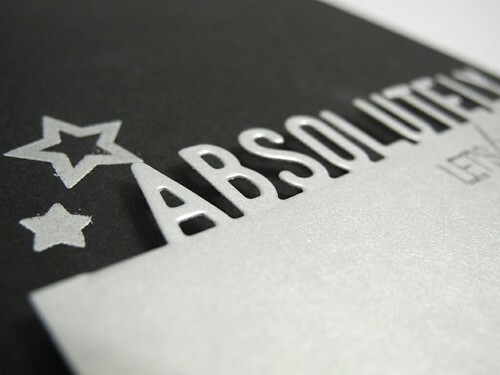 cool card..love the silver and black.. I got this die too and I can't wait to use it. It really makes a wow statement on a card! I like the shimmery bow on top! Gorgeous die cut and what a sophisticated, elegant colour combination! Thanks for playing along with CASology this week - we think you're a star! Oh my...twenty you say. Well, I can understand why...love this card. You make me wish that I made cards too. I absolutely LOVE your card. What a great idea. Fabulous CAS card! Love how you used the Simon die! What an outstanding card, such an impact it creates. I hope you have a very merry holiday! Beautifully done- bet the Silver looks even better IRL! I always love the CAS cards you make- and I think CAS is so hard! Love your beautiful CAS card. An amazing CAS card Jennifer, so dramatic with the black and white, perfect details and touches of silver. Beautiful card Jennifer! Love the silver against the black! Very elegant!! A perfect CAS design! This turned out great. Stunning and sophisticated. Nicely done. Simon Says Stamp Challenge - We are GIFTED! Glitter. I like it. Just sayin'. A Fresh Squeezed Christmas GIVEAWAY! Neon Party People are Moxie Fab on the Runway! Do You Give Gift Cards? Stampendous! and DIY Bangles Blog Hop!